​This Chicken Okra And Tomato Dish You Totally Have To Try Out For The New Year - GlobeFarers | Travel Tips & Tour Bookings. Growing up I never liked okra, but mom loved it so she cooked it more often than not, we kids dreaded when we had to eat okra soup for dinner. Okra is a flimsy vegetable and I hate how it drips when I try to scoop it with my eba. I love experimenting with food, so you can imagine how excited I was when I discovered a new way to make okra work for you. Also this new year, after being sick too often, I resolved to eat more healthier meals. We get so caught up eating all kinds of meals during the festive season, that we forget to eat balanced healthy meals, but eating healthier meals doesn’t mean you have to sacrifice flavor. This dish is infused with this flavor-packed Creole Seasoning. You can use the store-bought ones but nothing beats the homemade version of creole seasoning. It has more depth in flavor as it can be easily to customized to your own persona reference. 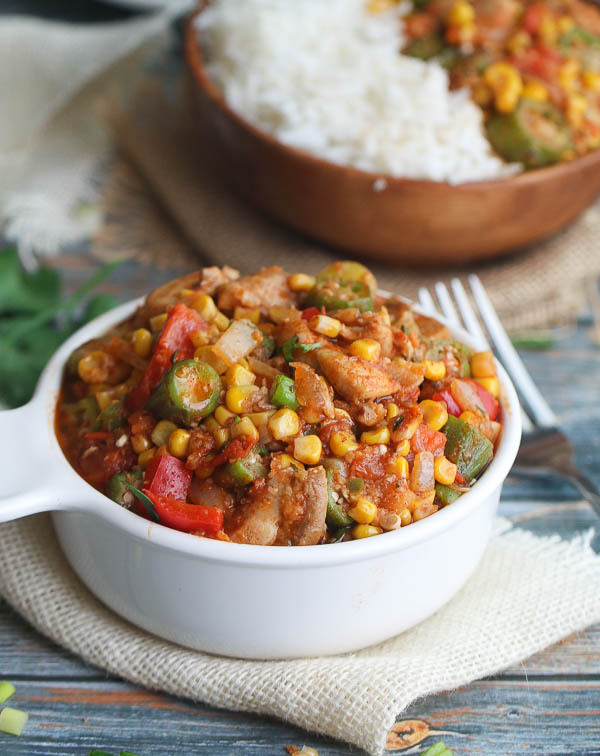 The Creole Chicken Okra is a healthy, out of the box meal that combines the bounty of a summer vegetables — corn, okra, tomatoes peppers and infused with creole spices. It comes together quickly without over cooking so you would hardly notice any slime. 1. Cut chicken into bite size pieces, and then season with creole spices or salt. Heat a saucepan with about 1 tablespoon of oil. Add chicken and sauté for about 5 minutes or more. Remove and set aside on a plate Throw in onions, garlic, jalapeno, bay leaf, thyme and paprika, add 2 tablespoon oil or as needed, then sauté for about 2 -3 minutes. 2. Then add tomatoes, cayenne, corn, bell pepper cayenne pepper chicken and paprika, cook for about 5 minutes. 4. Serve with my rice and corn bread. It is always amazing when served with rice on a plate, or with spaghetti or noodles or can be made completely vegan without the chicken and it is still hearty and filling.